This is an equipment including automatic pipe tube counting machine, bag making machine, bag filling machine for pipe. It is an efficiency and nice packaging for saving labor and material cost. The machine is able to handle the 3/6/10PCS pipe per time. It will greatly save your labor cost and improving packing speed. It is for gathering the pipe from production line and automatic counting for bag packing preparation. 4. Automatic pipe bag making. 5. Automatic pipe bag filling. 8. High packing speed with 10 pipes per time. 9. Indicator alarms automatically when trouble occurs. Trouble can be shown automatically. 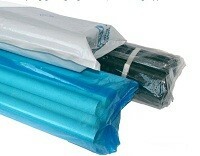 We are the leading integrator of end-of-line packaging solutions for pipe bag packing. With installations around the world and full aftermarket support, our pipe bagging packaging systems for pipe/tube have been successfully implemented in the following industries: stainless steel pipe/tube, plastic pvc pipe/tube, copper tube, pipe, and a wide variety of industrial and long shape products. Fhope breadth of equipment is rich experience in the industry and includes: turnkey integrated pipe packaging systems, including, pipe counting, pipe gathering, alinging, bundling and bag filling packing, shrink wrappers and bundlers, stretch wrappers. Fhope, manufacturing, training facility and installation are centrally located Shanghai. Our target is with heavy-duty, standard & custom-designed pipe bag packaging system for a wide range of industries.